- 600+ adult members (average age is about 33 years). More than 500 have been with us for more than a year. We have very little turnover.. virtually no drama- and an extremely loyal and unified team of friends. That shows in our forums.. it shows in game.. it shows in Ventrilo.. we have an absolutely wonderful team that has been together for years and will be together for many more years. - Featured in a documentary full length feature film about MMORPGs. Have you seen the "Trailer" for the Second Skin documentary? You can do so here: http://www.purewestmedia.com/secondskin/ We are mentioned by name about 20seconds into it and we are all over the full movie according to the producer. - The only MMO guild with a book published about us. Have you read "Legend of The Syndicate"? You can buy a copy at a 40% discount from the publisher because you are a member of the guild. Go to http://www.avaripress.com and buy the book. When you checkout enter the discount code "llts" and you get 40% off. 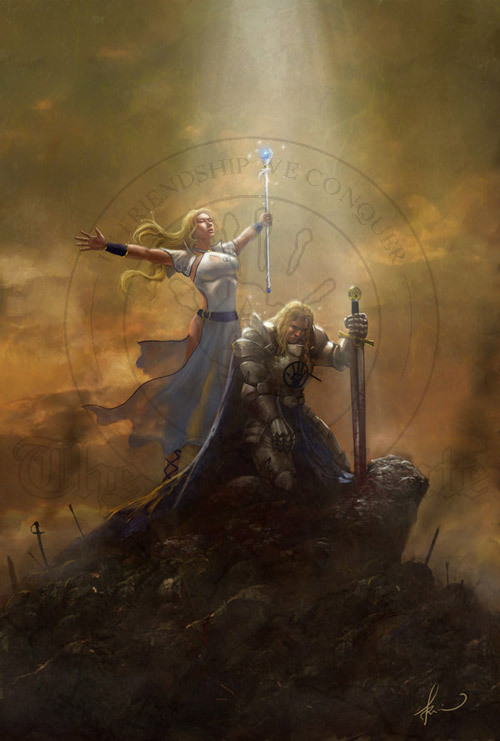 - The only MMO guild to have Trademarked their name. Multiple developers already enforce the mark in their games. We are in talks with others to work out the logistics of doing so in theirs. Regardless, when the day is done there is only one Syndicate and it is you both legally and through your dozen years of achievements. - We are planning our 7th annual Syndicate World Conference. This years takes place in Boston on Aug 21-25th. We have 106+ people already signed up and planning to be there. That is the most people we have ever had signed up this early. I am anticipating this being one of our largest, if not 'the' largest, conference. I've already begun ordering schwag :) and we are planning dinners and fun events. I hope you can make it! Go to wiki.llts.org and see the link there for details. - Our alliance with Prima Games remains strong. We just recently had the Pirates of the Burning Seas guide published and we have a team of 20+ members working on the Warhammer Online guide. Already our name, logo and website are on the cover of books laying on the desks and sitting on the shelves of tens of thousands of gamers' households. By every measurement that is meaningful we are the top dog. There is no other guild anywhere close to us in overall success as a successful juggernaut of a virtual community.